Our Spectroradiometers are calibrated measurement systems of different spectral wavelength ranges for analysis of radiant sources and materials whose properties have spectral distributions. The Series OL770 is a high-accuracy CCD-Array Spectroradiometer for laboratory and QS use. It can be adapted easily to different measurement tasks utilizing a fiber optic probe interface and various measurement optics. 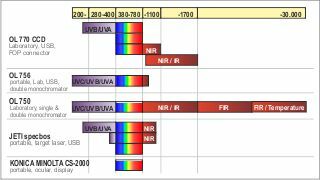 The Series OL756 is a high-precision and compact UV-VIS Spectroradiometer for the wavelength range of 200-800nm. It is especially useful for tasks which requires measurements of high dynamic within a spectrum e.g. for photo-biological Safety. The Series OL750 is an automated scanning monochromator for the use as a flexible core-component for highest requirements into laboratories. Modular input and output optics allow the adaptation to measure all major properties of optical radiation. The Series specbos is a certified calibrated USB compact spectroradiometer for portable measurements as well as for measurements in process control. A unique laser target is marking the measurement spot. The Series CS-2000 is a precise spectroadiometer for light- and color measurements also for very small spots size and extrem low luminance level. The spot size can be switched manually at the divice for 0.1°, 0.2° and 1.0°.